Pioneer Electronics Asia Centre will be showcasing its comprehensive product ecosystem at the 37th Bangkok International Motor Show (BMS). The product will consist of automotive infotainment systems. AVH-X8850BT multimedia receiver — This latest flagship model promises a truly unparalleled driving experience. Smarter and now compatible with even more popular apps such as Spotify thanks to integrated Apple CarPlayi, and Pioneer’s proprietary AppRadioMODE and AppRadioLIVE. GM-D9604 four-channel amplifier (amp) — Easily one of the most powerful and versatile multi-channel amps from Pioneer’s Champion Series, yet is around 50 percent more compact than conventional models on the market. TS-D1730C and TS-A1606C component speakers — These premium speaker packages are targeted at discerning music lovers. The TS-D1730C is developed to reproduce amazingly open and smooth sound, while the TS-A1606C stands out with its high dynamic range. Both also come with a pair of high-quality crossover networks. TS-W261D4 and TS-WX120A subwoofers — The TS-W261D4 is another Champion Series product offering an innovative construction to achieve clearer and deeper bass. Meanwhile, the TS-WX120A is an ultra-compact model with uncompromising powerful bass. Apple CarPlay — A smarter, safer and more fun way to use iPhone® in the car. Consumers can use Siri® voice control to make and receive calls, compose and respond to text messages, access Apple Maps for navigation, and listen to their music and podcasts. Spotify— Enjoy over 30 million songs via the world’s largest online music-streaming service. Moreover, users can conveniently browse, search and select titles directly from either the receiver or phone. 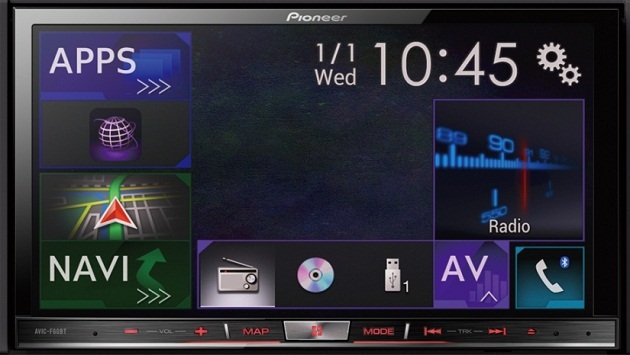 Pioneer ARC — For iPhone and Android smartphone users, this free application is a complete in-car entertainment solution, optimised to seamlessly access content from both the receiver and connected device. This model will be available at all Pioneer authorized dealers from the end of March onwards.